Blueberries are just coming into season here in the UK so when I spotted a stack of boxes containing the little blue jewels I knew I had to have some. Berries remind me of everything summery and cheesecake is one of my favourite desserts. 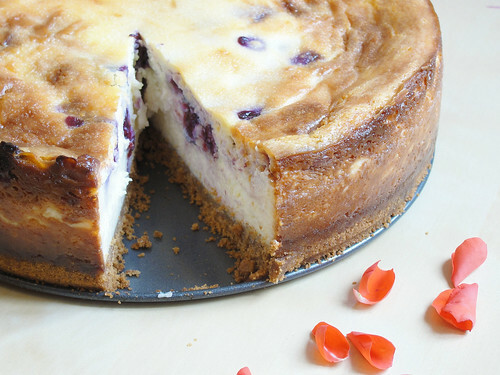 Eggless baked cheesecake is a rare and delicious treat, which I only make once in a while. I?ve been using Kurma Dasa?s wonderful recipe for years and the finished product is always breathtakingly yummy. As a child I used to read my mum?s copies of Great Vegetarian Dishes, Cooking with Kurma and Quick Vegetarian Dishes like they were storybooks; of course, admiring the stunning pictures was the most captivating and exciting part. As I grew older I was able to cook and sample the vast array of dishes showcased in these most treasured books, and the original version of this eggless baked cheesecake was one of the best I had ever tasted. Since then, I have been experimenting with the countless flavour combinations that there are. 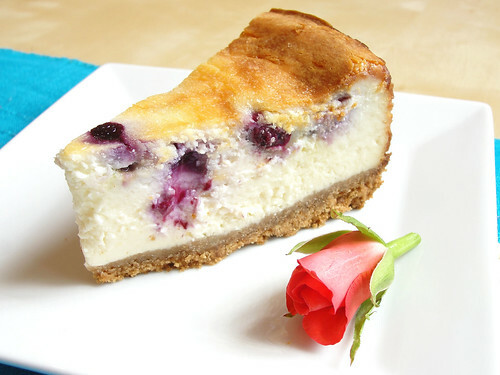 Blueberry and white chocolate? Win. I love how the berries burst in the oven and stain the pristine white of the soft cheese a shade of striking deep purple. Beautiful. 1. Combine the crushed digestive biscuits with the melted butter and mix thoroughly. 2. Firmly press the mixture into a greased 10 inch springform tin. 1. Beat together all of the ingredients (excluding the blueberries) until it has thickened. Kurma suggests not to overmix this. 2. Pour ¾ of the mixture on top of the crust and scatter on the blueberries. Pour the rest of the cheese mixture over the blueberries. 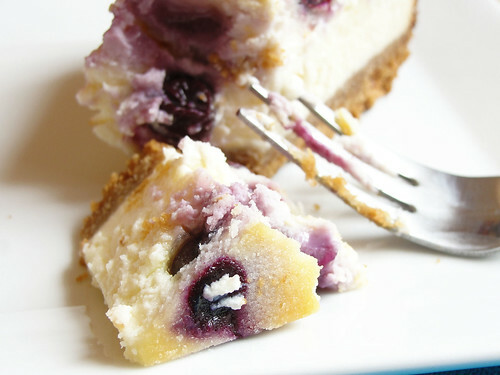 This method protects the blueberries from burning in the oven and the flour they are dusted in will stop them from sinking to the bottom of the cheesecake during cooking. 3. Bake at 180 degrees Celsius for 1 ¼ hours until set (I left mine for 1 hour because my fan oven cooks things a little quicker). 4. Allow to cool and refrigerate for at least 8 hours. 5. Cut into (extra) large wedges and serve to your nearest and dearest yourself. P.S. 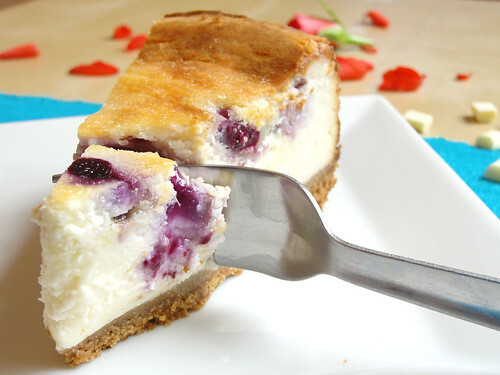 I've also frozen this cheesecake whole and it still tastes great when defrosted (although the base may lose some of its crunch) but you can always make it ahead of time.